With an ideal balance of dirt-trapping efficiency and dirt-holding capacity, every FRAM® oil filter uses a special blend of fibres and resin providing a proprietary filter media that delivers excellent engine protection. • SureGrip® texture makes changing any FRAM® oil filter easier, faster! To find the application suitable for your vehicle, check the Wal-Mart in-store catalogue. See in store for individual model pricing. Available applications may vary by Store. 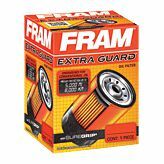 FRAM® Extra Guard® Oil Filter media utilizes a blend of cellulose and synthetic microscopic fibers to provide an ideal balance of dirt-trapping efficiency and dirt-holding capacity.